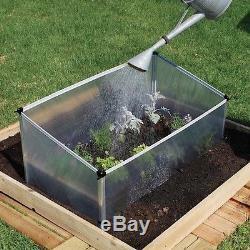 Cold Frame Greenhouse Garden Large Plant Raised Bed Patio Lawn Yard Gardening. 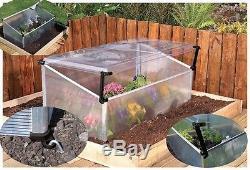 Home & Garden/Yard, Garden & Outdoor Living/Gardening Supplies/Planters/Large Cold Frame Greenhouse. 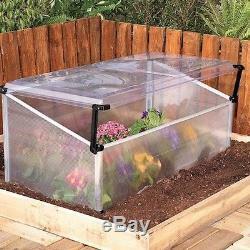 This Large Cold Frame Greenhouse has Insulated polycarbonate sidewalls to protect your tender seedlings during cool nights. Large Cold Frame Greenhouse also has high impact, durable and UV protected panels, and a sloping lid allows maximum sunlight and rain runoff. This Large Cold Frame Greenhouse, has a Hinged door for easy access and ventilation, which will make raising your Plants in this Large Cold Frame Greenhouse Rasised Bed, alot easier in the Lawn, Patio or Yard. Cold Frame Greenhouse will make Gardening a simple Joy! 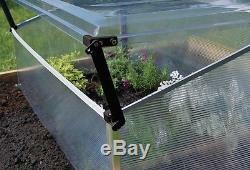 Large Cold Frame Greenhouse Features. 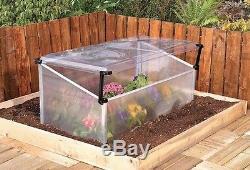 Cold Frame Greenhouse can Grow in your containers or directly in the soil. Clear, adjustable polycarbonate cover provides maximum light and just the right amount of ventilation. Can be anchored to the ground in 4 designated corners. Over 5 square feet of growing space. Cold Frame Greenhouse is 3.5 Ft. 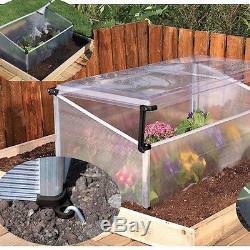 Overall Measurement of this Cold Frame Greenhouse are: 1.5\' H x 3.417\' W x 1.9\' D.
Thank You for Checking out this Large Cold Frame Greenhouse. Please DO NOT return the item before contacting us, first. If there are any damages, you will be asked to take a picture of the defect, so we too can return it to our supplier. The item "Large Cold Frame Greenhouse Garden Plant Raised Bed Lawn Patio Gardening Yard A" is in sale since Thursday, July 09, 2015. This item is in the category "Home & Garden\Yard, Garden & Outdoor Living\Gardening Supplies\Plant Care, Soil & Accessories\Baskets, Pots & Window Boxes". The seller is "bunzaroony" and is located in Kansas City, Missouri. This item can be shipped to United States.